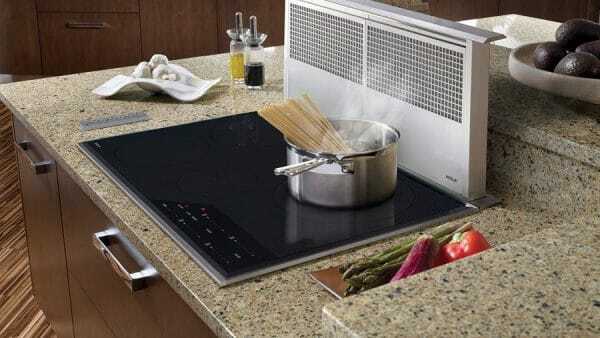 Induction cooktops are a great addition to any kitchen. Here’s what you need to know about these modern cooktops. Why choose an Induction Cooktop? Induction cooktops, like the model built by Wolf, are known for their quick heat up times and consistency of heat across the cookware. When used with the correct cookware a magnetic field causes just the bottom of the pan to heat up. There is no open flame or glowing coil to contend with, plus the heat is even, cooking your food evenly. How do I take care of my Cooktop? Along with the technology is the ease of care. Spills are cleaned with warm soapy solution and a kitchen sponge. Spills that burn onto the glass are simple to remove with a razor blade scraper and some cooktop cleaning solution. These are shipped with the units, but if you don’t have one or if you need a refill call us! So, when should I call for service? Well, the simplest answer is when the cooktop is non-responsive. The touch controls on the glass should always respond. Make sure that your controls are not locked by holding the lock key for 5 seconds until it beeps. If the cooktop does not beep in response, check to make sure that you have power at your circuit breaker. If that seems fine, then give us a call, we will be more than happy to help you.